Explanation: Asteroid 2002 NY40 will fly by planet Earth early in the morning August 18 Universal Time (late in the evening August 17 Eastern Daylight Time). Approaching to within about 530,000 kilometers or 1.3 times the Earth-Moon distance 2002 NY40 will definitely not be close enough to pose any danger of collision. But it will be close enough and just bright enough for experienced skygazers to see this 800 meter wide space rock in a small telescope or binoculars as it glides quickly through northern skies past the bright star Vega. It will also be close enough to ping with radar, and asteroid hunters using the large Arecibo radio telescope in Puerto Rico expect to determine the three dimensional outline of 2002 NY40. Similar investigations of other near Earth asteroids have revealed some surprising shapes. 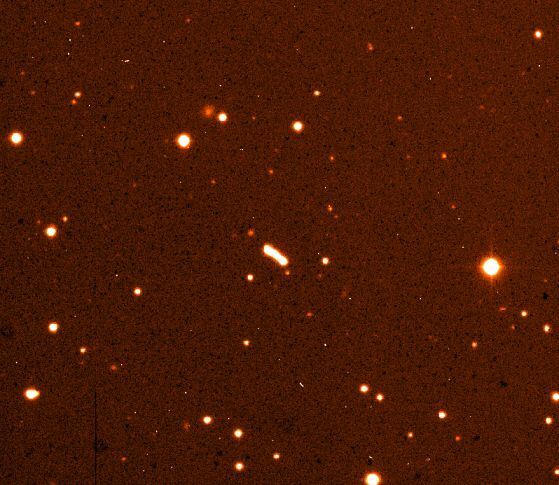 In this five minute time exposure, recorded at Cerro Tololo Inter-American Observatory on August 14, 2002 NY40 shows itself as a long smudge as it moves against a background of faint stars in the constellation Aquarius.